Austria: Innsbruck Old Town (Altstadt) and Goldenes Dachl from the City Tower (Stadtturm) – Travel Photography By Simon Kirwan. The Goldenes Dachl (Golden Roof) is a landmark structure located in the Old Town (Altstadt) section of Innsbruck, Austria. It is considered the city’s most famous symbol.Completed in 1500, the roof was decorated with 2,738 fire-gilded copper tiles for Emperor Maximilian I to mark his wedding to Bianca Maria Sforza. The Emperor and his wife used the balcony to observe festivals, tournaments, and other events that took place in the square below. (Wikipedia). This entry was posted on Thursday, November 6th, 2014 at 6:55 pm. 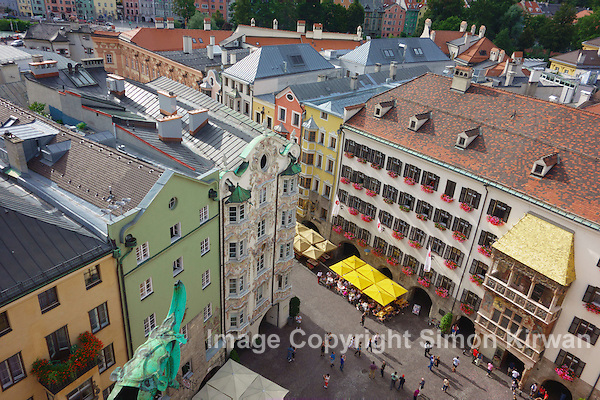 It is filed under News, Travel Photography and tagged with Altstadt, Austria, Golden Roof, Goldenes Dachl, Innsbruck, Old Town, Stadtturm, travel photography. You can follow any responses to this entry through the RSS 2.0 feed.